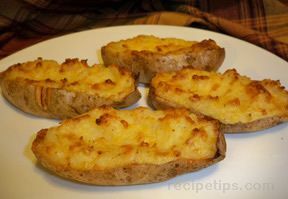 The crisply potato shells holding that creamy filling are an elegant side dish to your main entree. 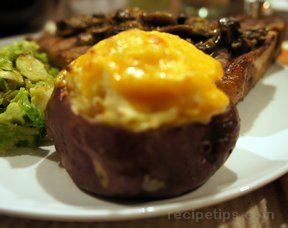 These potatoes could also be frozen and then thawed and baked up later. Bake potatoes as directed; let stand about 10 minutes. 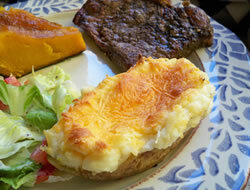 Cut a lengthwise slice off the top of each baked potato; discard skin from slices and place pulp in a bowl. Scoop pulp out of potatoes; add pulp to the bowl. 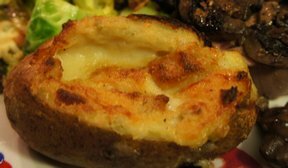 Mash the potato pulp with a potato masher or an electric mixer on low speed. Add sour cream, garlic salt and pepper; beat until smooth. If necessary, stir in milk to reach desired consistency. Season to taste with salt and additional pepper. Stir in 1/2 cup of the cheddar cheese and chives, if desired. Divide the mashed potato mixture evenly among the potato shells. Place in a 2-quart baking dish. Bake, uncovered, in a 425 F oven for 20-25 minutes or until light brown. Sprinkle with remaining cheese. Bake for 2-3 minutes more or until cheese melts. "I made these with our steaks and asparagus last night. I also added bacon into the potato mixture cause bacon makes everything better, right? These tasted great. We ate the shells and all."